Hey! I just learned a cool Windows 10 installation trick for dual or multi boot scenarios. 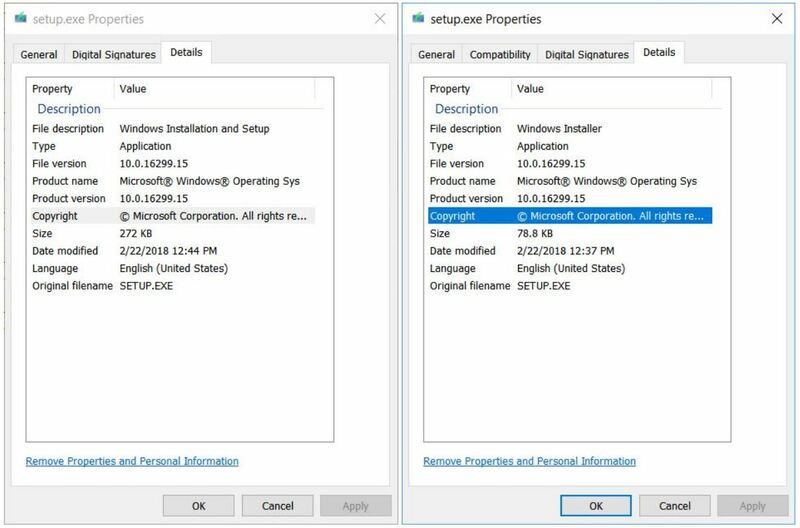 Turns out there are two different versions of setup.exe on a typical bootable USB flash drive (or other installation media). One resides at the root of the drive, the other in the \sources folder. Run the version at the root while Windows is running, and you’ll launch into a typical in-place upgrade repair install scenario. This is great for system repairs. Run the version in the \sources folder, and you can launch a separate install that targets some partition other than the current boot/system partition. And that, dear readers, is why I entitled this post two Win10 Setup.exes offer differing capabilities. How Do Two Win10 Setup.exes Offer Differing Capabilities? \sources version on the left, UFD root version on the right. Notice the difference in file sizes (272 vs 78.8 KB). Just for grins, I ran the file comparison command (FC) and the old WinDiff utility against the two versions. Because they’re binary files (which I didn’t attempt to reverse compile) all I can see is that there are indeed lots of differences between the two files. Also, the \sources version has a lot of stuff in it that the root version does not. That’s what I’d expect, based on the difference in file sizes. The key distinction comes from the uses to which these two different setup files may be put. The \sources version works to set up dual- or multi-boot at runtime inside Windows 10 itself. No need to boot to alternate media and run the installation outside your normal, comfortable runtime. The root version is for performing upgrade installs (or repairs) to the OS that’s currently running. Good to know! [NOTE] Here’s a shoutout to TenForums.com fellow guru and regular NavyLCDR, who in turn credits rescue media maven Kyhi for this trick in thread#7 of a post entitled Boot 2 copies Win10 Pro in Separate Partitions. Thanks, guys!